In a prime illustration of the Regency era's appreciation for exotic colors and materials, the surface of this museum-quality Irish specimen console table is inset with 75 of the world's rarest and most important marbles and prized stones, many of which were primarily utilized in antiquity. The workmanship of this tour de force is attributed to the Dublin firm of Mack, Williams & Gibton, the premier makers of Irish furniture renowned for their utilization of the finest timbers and overall outstanding quality of their creations. 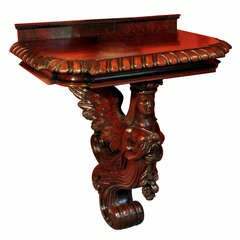 The base of this table, with its regal lion paw feet and acanthus elements, is crafted of solid Honduran mahogany and was commissioned to accommodate the specimen surface, which was likely acquired during a Grand Tour. Marble specimens such as this one were the most prized souvenirs of the Grand Tour and were avidly collected by savvy upper-class tourists while in Italy. The acquisition of quality marble was a pursuit in which only the most privileged members of society indulged, and these meticulously crafted pieces, in particular, played a large part in displaying one's sophistication and good taste in many European estates. This particular table surface boasts specimens including Imperial Egyptian Porphyry, Greek Porphyry, Sicilian Jaspers, Occhio di Pavone, Breccia Verde d'Egitto, Brocatelle de Jura, Connemara, as well as rare fossil marbles amongst many other Fine and rare stones. 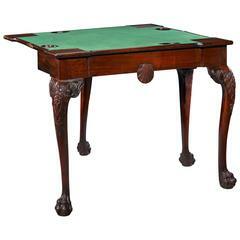 Because of the significance of such a souvenir, there is little wonder why Mack, Williams & Gibton were chosen to Craft this exceptional table. With a history that dates back to the late 18th century with founding member John Mack. By 1801, Mack was joined by fellow cabinetmaker Robert Gibton with whom, in 1806, were officially titled "Upholsterers and Cabinet Makers to his Majesty, His Excellency the Lord Lieutenant, and His Majesty's Board of Works". In 1812 Robert Gibton died and was succeeded by his son William Gibton (1789-1842) who brought with him a former apprentice, Zachariah Williams, thus creating the new partnership of Mack, Williams & Gibton. The firm held the Royal Warrant for many years and enjoyed the patronage of some of the wealthiest members of Irish society, while also creating pieces on behalf of the Irish government, circa 1830 Measures: 48 1/2" wide x 16 3/4" deep x 32" high. 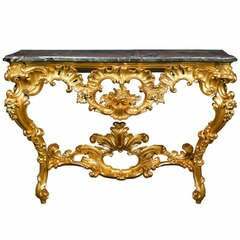 An English Regency console table in rosewood, with two carved and water gilded monopodia legs. The top of Belgian marble. 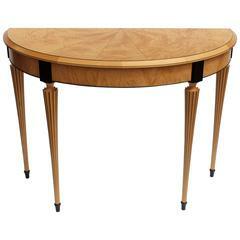 Modern travertine marble base with long glass top console table. (Please confirm item location - NY or NJ - with dealer). 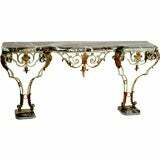 19th Century George III Style Carved Mahogany Specimen Marble-Top Console. 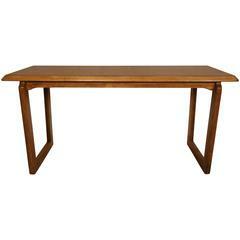 Very nice Mid-Century Modern table made of rich walnut grain by Lane on a set of sled legs. (Please confirm item location - NY or NJ - with dealer).